Game 1 of their Stanley Cup Playoff series with the Los Angeles Kings did not go the way the Vancouver Canucks had hoped. They came out flat, took mindless penalty after penalty and ended dropping the game 4-2. While the effort put forth should concern fans of the Canucks, the antics of one of the team leaders should be more concerning. Ryan Kesler is one of the team’s hardest working players and when at his best he flies around the ice, digs for pucks, throws hits and scores big goals. Last night was not Kesler at his best. Instead we saw the Ryan Kesler of three or four years ago. The player who seemed more interested in being a pest and taking dives. We were supposed to be past this. There was a lot of talk around Vancouver last year and this past summer about the perception of the team as divers and pests. Kesler himself talked about how he had looked at his antics and decided to focus more on between the whistle stuff. Henrik Sedin and Kevin Bieksa have both talked about how the team needs to stop taking dives, stop embellishing and stop giving officials a reason to doubt them on the ice. For the most part the Canucks have played a clean season. There has been an occasional dive here and there but no more than your average NHL team. But last night, in the first period, Ryan Kesler skated in front of Kings goalie Jonathan Quick and apparently got hit by Quick’s stick. In reaction he threw his head back and managed to distract Quick from stopping Alex Burrows shot. The Canucks were lucky not to get that goal waived off. Later in the period he gave Quick an unnecessary snow shower and the officials put him in the box for it. While that call is rarely made, it was only a few weeks ago when Kings forward Klye Clifford got the same call, in the same building, against Roberto Luongo. Kesler should not have been surprised as he was right there for that play. While short handed the Canucks went down two men after a delay of game call and the penalty parade was on. Kesler needs to be smarter than that. Probably his worst moment came in the third period when he got engaged with Mike Richards after a face off and started rolling around on the ice, trying to get a call. It was childish, obvious and the officials did not fall for it. What did Kesler think he was going to accomplish there? 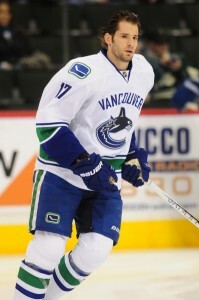 While he may not wear the ‘C’ on his sweater you could argue that the Canucks go as Ryan Kesler goes. When he is more interested in agitating and trying to draw penalties he is not doing what Canucks fans have dubbed “Beastmode”. That mode was the guy we saw seemingly beat the Nashville Predators all by himself. That is the guy who wants to win so bad that he’s willing to fight through pain in order to win. That is the guy the Canucks need in Game 2 and for the remainder of the playoffs. Instead of dropping to the ice Kesler needs to come out with a fury. If he wants a penalty, earn it. Going into ‘beastmode’ will draw penalties. The officials will reward guys who go hard as the defense will have to grab on to slow him down. As a team leader that will inspire those around him. If we see more of Kesler’s Game 1 act this series could be over quick and needless to say a tumultuous summer will begin in Vancouver. The Canucks have the talent to win it all, they need to prove they have the head to do so. It starts with Ryan Kesler.